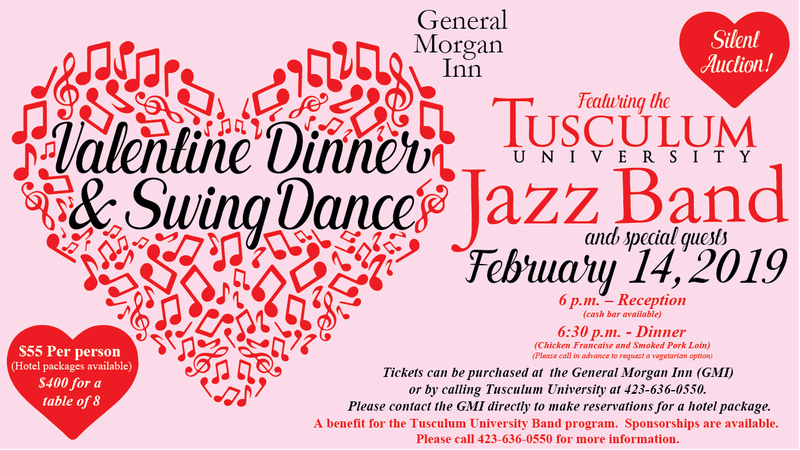 The Tusculum University Pioneer Jazz Band will provide an exciting way to celebrate Valentine’s Day and support a good cause with a benefit dinner and swing dance at the General Morgan Inn. The reception begins at 6 p.m. and dinner will follow at 6:30 p.m. Thursday, Feb. 14. Following the meal, the Pioneer Jazz Band will perform a wide selection of uplifting jazz standards and incorporate other special guests in the event. Dance lessons taught by Robin Beale will be available starting at 5:30 p.m. The event will also feature a silent auction. Guests can bid on items until the start of the second dance set. David Price, Tusculum University’s director of music, said the popular event, now in its sixth year, raises money for essential equipment to support the entire Tusculum band program. Ticket prices are $55 per person or $400 for a table of eight guests and include dance tickets, free dance lessons, the reception, dinner and a special dessert. Please call the General Morgan at 423-787-1000 in advance to request a vegetarian meal substitution. A cash bar will be available. Special table reservations are available for larger-group seating by calling Price at 423-636-0550 or emailing daprice@tusculum.edu. Tickets are available for purchase at the General Morgan or by contacting Price. A hotel package special is also available by reaching out to the General Morgan. This year, in preparation for the event, Tusculum will hold swing dance lessons at 7 p.m. Tuesday, Jan. 29, and Thursday Feb. 12, in the Chalmers Conference Center in the Niswonger Commons on campus. The lessons are free to anyone who has tickets to the Feb. 14 event. Dance lessons for those not attending the Valentine’s Day event are $10 per person. Tusculum’s band program began in 2010 with the creation of the Pioneer Pep Band. Since then, the program has added a concert band, jazz band, marching band, handbell choir and several small ensembles. The groups play several events each year on campus and in the community.